[dropcap]H[/dropcap]arissa (حريصا), the beautiful Mountain Village in Lebanon that caress the huge statue of Virgin Mary. The Lebanese are known to call that statue Our Lady of Lebanon. Situated about 25 minutes North of Beirut (20km), the Village overlooks the beautiful green hills and the Mediterranean Sea. Whilst standing on top of the hill, you can enjoy the beautiful scenes in which you can overlook Beirut from the top, on one side, and on the other, you can see Tripoli and other Northern Cities. The scenic views are truly priceless, you will certainly enjoy every bit of it. I have been to Harissa probably more than 15 times, and every visit is just as spectacular as the one before. It is so wonderful to be up there as you get to experience different feelings at once. You enjoy the wonderful scenic views, at the same time, you are a religious place that embraces all religions. People of all races, religions, and sects visit Harissa for so many different reasons. Some visit Harissa as a pilgrimage, others visit to request a miracle, whilst some visit to pray their usual Sunday prayer. Let me tell you though, if you are a tourist in Lebanon, and you are spending a few days only, DO NOT VISIT HARISSA ON A SUNDAY. It is usually PACKED with people. It would probably take you so much time to get up the mountain and down again that you would waste a whole day. Visit is it any other day and it will be so much better. 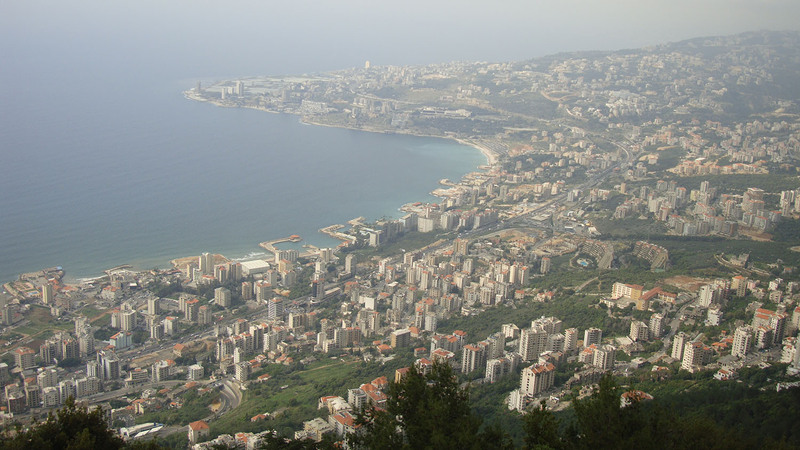 Harissa is well known for being a religious pilgrimage site. Entering the gates of the Church and the Harissa (Lady of Lebanon) Statue will certainly throw a rush of hypnotic feelings inside of your body. That feeling you get being inside a miraculous place. You see so many visitors praying for the sick to become better, or even the sick themselves visiting in hope of a cure. The statue is situated on circular base that elevates approximately 3 to 4 floor levels. The staircase surrounds the base in a circular manner until you reach the top level which allows you to be near the statue. Yet, you will not be able to touch the statue directly as it will still be higher than your head level, and is surrounded with metal protective bars. This picture was taken during one of my winter visits. This spot is truly beautiful year round. Beneath the base of the statue lies a small Chapel. The Chapel carries a regular Sunday Mass (which is the reason behind all the traffic on a Sunday). The Chapel is very small, it barely fits 40 persons at once. However, it is usually packed when a regular mass is in progress. Most of the people will usually be standing outside the Chapel and listening to the outdoor speakers that transmits the mass prayers in progress. The Chapel is open all days of the week, and when it is not a Sunday, you can simply walk in for a quick prayer, turning a candle on, or simply to gaze at the beautiful dome shaped Chapel. The top of the Chapel has a small empty cylindrical passage that passes up through the top to the Statue on top. It basically does nothing, but it is simply there. You will notice various people taking of their shoes and walking up the staircase to the statue barefoot as a symbol of humbleness and respect to the religious place they are in. The staircase barely fits the up-going and down-going visitors at once, nevertheless, it is not much of a trouble to get to the top. Remember to enjoy the amazing views on each side whilst you are circling the staircase to the top. You will notice a Church set on another mountain that looks wonderful (picture below) from one side of the staircase. As the stairs is set in a circular manner, you will get to experience sea views, land views, and views of the surroundings of Harissa. Once you get to the top you will find a lot of people gazing at the beautiful Virgin Mary statue that is situated high on the mountain, overlooking and protecting the country of Lebanon. Other people may be praying close to the base of the statue hoping their prayers will be heard as they are in historically miraculous place. The statue may be decorated with flowers, ribbons, or other joyful materials to celebrate a certain occasion, eid, or holiday. The church on the neighboring mountain which you can see from one side of the circular stairs leading to the Virgin Mary Statue. The statue of Our Lady of Lebanon is made of pure bronze, and is painted white. The crown on Virgin Mary’s head carries several stars that has been recently painted Gold. It is said that the statue was inaugurated in 1908. The small Chapel is not the only church found within Harissa. A much larger church that is beautifully built carries a much larger mass and can fit a lot more people, is located right next to the statue. Once you are done with the statue’s visit, make sure to visit the small Gift Shop located to the right of the Statue. You can buy various symbolic and iconic souvenirs that will remind you of your beautiful trip to Harissa. Also, you will find a small booth located opposite to the entrance of the small chapel, where you can donate any amount of money, in return you will be given candles and oil (supposedly Holy Oil) spilled cottons. You can light the candles in a specific green ceramic area created next to the booth, and you can use the cotton as a symbolic form to put on your forehead and palms. This is a historic method known in churches around the world where they use oil to draw crosses on your forehead and/or palms. There are two method to get to the top of the mountain (Harissa) where the statue of Our Lady of Lebanon is located. The first method is by car, it would take you about 25 to 30 minutes from Beirut, if there is no traffic. If there is traffic, it could take up to an hour to get there. The roads to Harissa are all uphill, and start with wide roads that turn around the mountain, whilst ending with narrow roads that barely fit two cars in opposite directions. Yet, it is not dangerous, and relatively easy to get there. A taxi fare from Beirut would charge about 40 to 60 US Dollars. The second method of getting to Harissa, is using the “Telefrique” or what is known as hanging cable cars. You will still have to get to the lower side of the mountain, closer to the sea, where the entrance of the cable cars is. I cannot remember the precise fee of the cable cars entrance, but it was not that expensive, and it is a fixed price, so no scams there. Using the cable cars would probably take about the same time as the car to get up the mountain. Yet you will get to enjoy more scenic views in the hanging cable cars. If you are in Lebanon you would probably have understood already that electricity is not quite stable over there. Power cuts occur all the time, many times a day. This is applicable to cable cars too. I had a cousin who got stuck in mid-air, on top of the trees and green mountains for a couple of hours, before the cable cars got to work again. Now, this might not occur frequently, unless a power generator has suddenly stopped working (as is in my cousin’s case). I, personally, prefer the car ride, as I have done the cable car ride so many times, it is just not fun anymore. I love the car ride up the mountain, it is relaxing, with sea views all the way up the mountain, and is certainly fun. But, don’t miss out on the cable cars if you have never been on one before! I hope you get to enjoy your visits to Harissa as much as I did. It is certainly a spot I will continue to visit whenever I have time during my visits to Lebanon, as it is truly one of my favorite spots around the world. I enjoy every single second of it, and I end up spending the rest of the day in Jbeil, as it will be closer once you are visiting Harissa. So many amazing restaurants and souqs in Jbeil that you must visit. I will certainly write about Jbeil too soon.